CHICAGO--(BUSINESS WIRE)-- Hyatt Hotels Corporation (NYSE: H) announced today the opening of Hyatt Regency Dubai Creek Heights in Dubai, United Arab Emirates (UAE), marking the fifth Hyatt-branded hotel in the city. A sixth Hyatt-branded hotel, Hyatt Place Dubai/Baniyas Square, is expected to open in Dubai later this year. Each of the six properties is developed by wasl Hospitality, a subsidiary of wasl Asset Management, reflecting the strong and long-lasting relationship between the developer and Hyatt. With its two iconic high-rise towers piercing the sky at 164 meters/538 feet, Hyatt Regency Dubai Creek Heights is ideally located next to the resurgent Dubai Creek, providing elaborate views across the water and stunning city skyline. The hotel offers easy access to Dubai International Airport, which is only 10 minutes away. Dubai International Financial Centre (DIFC), Wafi City, The Dubai Mall and the cultural heritage districts are easily accessible by all means of transportation, and Dubai Healthcare City metro station is located a short walk from the hotel. The 464-room hotel offers distinctive design features, including a spacious lobby filled with 1,000 square meters/more than 3,200 square feet of plant walls, flowers and greenery, along with soothing water features and a towering glass ceiling embossed with Swarovski crystals. The open-to-the-sky view helps to bring the outdoor space into the heart of the hotel and illuminates the interior with the city’s year-round sunshine. The hotel also features 76 luxury suites, including two Royal Suites, each stretching the entire length of the hotel’s top two stories. One of the suites features a wrap-around outdoor terrace with a 360-degree view, and the other is designed to include a 7-meter-/23-feet-high dome ceiling and skylights. All suites include access to the exclusive Regency Club lounge on the 32nd floor, providing views of the historic Dubai creek. The Regency Club embodies Hyatt Regency’s ‘hotel within a hotel’ concept, offering an exclusive and elegant space for distinguished guests to gather, relax and enjoy complimentary breakfast and cocktails. “We have assembled a world-class team to bring a refreshing and enthusiastic spirit to Dubai’s buoyant hospitality market. Our vision seeks to redefine the guest experience in Dubai and offer a level of service excellence that is warm, energizing and engaging,” said Mathieu Greppo, general manager, Hyatt Regency Dubai Creek Heights. With business travelers in focus, the hotel includes 3,200 square meters/10,500 square feet of conferencing facilities, including 13 meeting suites and two interchangeable ballrooms to host a range of events: weddings, conferences or meetings. For more private and intimate events, guest can choose Al Manzil, an exclusive residential-style, multi-event enclave or select one of the Royal Suites, perfect for luxurious private events. Offering the ultimate in relaxation and rejuvenation, hotel guests and visitors can unwind in the extensive NYSA Spa, featuring the Water Temple, a traditional Hammam, state-of-the-art male and female gymnasiums and workout studios. An outdoor pool and eight spa treatment rooms, including two couple suites, complete the wellness facilities. NYSA Spa also offers an innovative business-oriented express spa menu. The hotel will open with Sufra, a buffet-style restaurant providing a culinary journey through the areas surrounding the Levant region. Sufra will feature an interior garden theme extended from the lobby. For gourmet grab-and-go options any time of day or night, guests will enjoy Market24, a 24-hour deli offering an authentic and modern approach to the classic pastry and coffee shop. The Lobby Lounge provides a comfortable and welcoming sense of arrival to the hotel, offering the perfect place for a business meeting, an afternoon snack or to catch up with friends. The Pool Bar offers an al fresco setting, allowing guests to unwind by the poolside. For added flexibility and convenience, the hotel also provides 24-hour in-room dining service. La Tablita, expected to open in summer 2015, is a fun and exciting Mexican-themed restaurant filled with vibrant colors. The restaurant will offer home-style cuisine and reflect the kindness, hospitality and lively festive spirit for which Mexico is renowned. For more hotel details and to make a reservation, please visit dubaicreek.regency.hyatt.com. Two hotels under Hyatt brands are currently operated in Abu Dhabi (Park Hyatt Abu Dhabi Hotel and Villas and Hyatt Capital Gate Abu Dhabi) and four hotels in Dubai (Park Hyatt Dubai, Grand Hyatt Dubai, Hyatt Regency Dubai and Hyatt Place Dubai/Al Rigga). 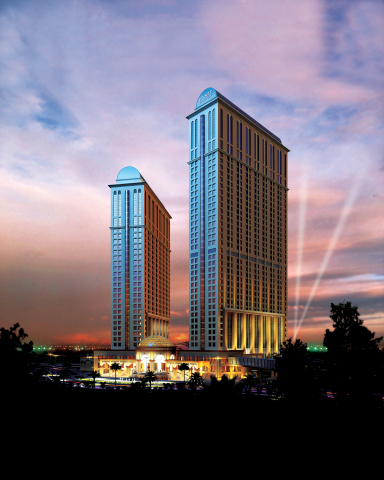 Hyatt Place Dubai Baniyas Square and Grand Hyatt Abu Dhabi Emirates Pearl are expected to open in the UAE subsequently. The Hyatt Regency brand is an energizing hotel brand that connects travelers to who and what matters most to them. More than 145 conveniently located Hyatt Regency urban and resort locations in over 30 countries around the world serve as the go-to gathering space for every occasion – from efficient business meetings to memorable family vacations. The brand offers a one-stop experience that puts everything guests need right at their fingertips. Hyatt Regency hotels and resorts offer a full range of services and amenities, including notable culinary experiences; technology-enabled ways to collaborate; the space to work, engage or relax; and expert planners who take care of every detail. For more information, visit hyattregency.com or facebook.com/HyattRegency. wasl Asset Management Group, one of the largest real estate management companies in Dubai, was established by the Dubai Real Estate Corporation (DREC) in 2008 to oversee the management of its assets and grow its real estate portfolio. Through its three subsidiaries; wasl properties, wasl hospitality & leisure and dubai golf; wasl operates in various real estate, lifestyle, leisure, hospitality and business sectors. wasl’s main objective is to strengthen Dubai’s position as the premier hub to live and work in and at the same time be the ultimate destination for tourists. For further information, please visit www.wasl.ae. wasl Hospitality manages a portfolio of several hotels and over 2,200 rooms. The Dubai-based portfolio includes five Hyatt-branded hotels, including the award-winning Grand Hyatt Dubai, Hyatt Regency Dubai, Park Hyatt Dubai, Hyatt Place Dubai Al Rigga and the just-opened Hyatt Regency Dubai Creek Heights, and four properties under Starwood Hotels and Resorts branding, including Le Méridien Dubai, Le Méridien Mina Seyahi Beach Resort & Marina, Le Méridien Fairway in addition to Jumeirah Zabeel Saray and the Westin Dubai Beach Resort & Marina. wasl also owns the Grand Cineplex movie theatre complex located adjacent to Grand Hyatt Dubai and acts as the Owner’s Representative to oversee the management of Dusit Thani Dubai hotel. Hyatt Hotels Corporation, headquartered in Chicago, is a leading global hospitality company with a proud heritage of making guests feel more than welcome. Thousands of members of the Hyatt family strive to make a difference in the lives of the guests they encounter every day by providing authentic hospitality. The Company's subsidiaries develop, own, operate, manage, franchise, license or provide services to hotels, resorts, branded residences and vacation ownership properties, including under the Hyatt®, Park Hyatt®, Andaz®, Grand Hyatt®, Hyatt Regency®, Hyatt Centric™, Hyatt Place®, Hyatt House®, Hyatt Zilara™, Hyatt Ziva™, Hyatt Residences® and Hyatt Residence Club® brand names and have locations on six continents. As of December 31, 2014, the Company's worldwide portfolio consisted of 587 properties in 50 countries. For more information, please visit www.hyatt.com.